As a new recruit to the Chicago police force, you've been assigned the task of clearing the city of gangsters. 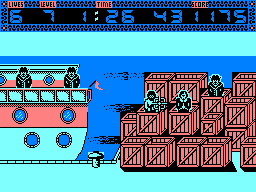 On each of the eight levels, you must shoot the gangsters while avoiding the civilians, for which points will be deducted. The graphics are pretty simple and so are the sound effects, and it is one of the easiest games I've ever played – I really did complete it on my first go! Still, if you're after a quick blast, you could do worse than this one. After stealing the magical book of spells in La Secte Noire, the Black Sect has returned to terrorise the population. They are gathering in a nearby crypt, and you have ventured into it, to annihilate this evil sect once and for all. Will you succeed? The crypt is filled with passages blocked by grilles, doors and chests to be opened, and lots of buttons to be pressed and levers to be pulled, and the secret rooms that come with performing these actions. 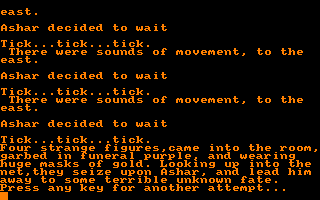 As with nearly all of Lankhor's other games on the CPC, this is a text adventure, and the graphics are beautifully drawn, capturing the sinister atmosphere of the crypt perfectly. The parser is rather limited, but this isn't too much of a problem. See also: La Secte Noire. Bentley the bear is exploring a castle and must collect all the gems from each room in the castle. Among some of the bizarre monsters to be encountered are marbles which home in on Bentley, tree spirits which Bentley can temporarily disable by jumping over them, centipedes which eat gems slowly, and witches. Both the graphics and sound effects are absolutely terrible, and Bentley seems to have his legs stuck together! This was originally released as a limited edition game, but it sold so poorly that it was re-released a few years later – and it's not surprising to see why when you see how it plays. It's a distinctly average game, although it's not really bad. The treasures of the Yolkfolk have been stolen from the Temple of Zeffar, and Dizzy has to retrieve them to avoid a curse falling on the kingdom – and so begins Dizzy's final adventure on the CPC. This game is quite different from Dizzy's other adventures. It's divided into four parts, and there are passwords so that you don't have to replay parts that you have already completed, which is a very welcome addition. 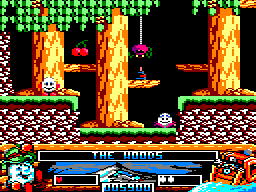 What is most noticeable, however, is that the graphics are in the high-colour, low-resolution MODE 0 instead of the normal four-colour MODE 1 that has been used in all of Dizzy's other adventures on the CPC, and I actually like the new graphics. On the other hand, most of the puzzles are easy to solve, and the conversation with other characters is often banal. See also: Bubble Dizzy, Dizzy, Dizzy Down the Rapids, Dizzy: Prince of the Yolkfolk, Fantasy World Dizzy, Fast Food, Kwik Snax, Magicland Dizzy, Panic Dizzy, Spellbound Dizzy, Treasure Island Dizzy. 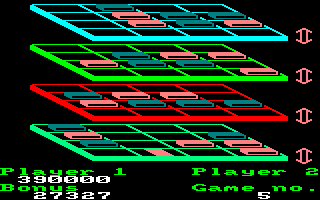 Noughts and crosses is brought into three dimensions as you play either a friend or the computer to be the first to line up four tiles in a row. Of course, as well as stopping your opponent making lines on one level, you've also got to keep an eye on them making lines that cross all four levels, if you see what I mean. However, this is easier said than done when you're playing the computer – maybe the human brain just isn't capable of visualising the lines in 3D. It's probably better to play with a friend, although the controls are awkward; you have to press fire quickly twice to place a tile, and it often doesn't work. In 19th century Spain, the French army is occupying large parts of the country. Now they have amassed enough firepower to destroy the entire country – but one warrior, Curro Jiménez, has the courage to confront and defeat the French single-handedly! You must travel on foot, on horseback, and even on a hot air balloon, through towns and across countryside to reach the French army camp. 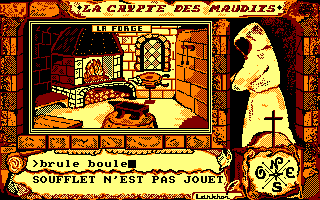 You are armed with a gun to shoot the French invaders, and along the way, you need to collect treasure chests to obtain dynamite; some chests may give you an extra life instead. The graphics and animation in this game are stunning, and unlike many Spanish games, it's relatively easy to make progress, although jumping over the barriers when you're riding a horse can be frustrating. Cursed Be the City is a Gothic-themed text adventure that was created using GAC. You play a character called Ashar, and begin your adventure bound to a rack in a dark and damp dungeon. You must find a way to escape this horrid place of misery and fear before the torturer burns out your eyes! As you can tell, this adventure is very dark in places and is not suitable for young children. Once you escape the dungeon you will eventually learn of your preordained quest. The location descriptions are generally rich with detail and it soon feels like you're reading a book. A lot of the characters in this one do have strange names, though, which makes your quest a bit confusing at times. If you're a fan of horror novels, then this one may appeal to you. A portal of evil has fallen on Sherwood, and it's up to Friar Tuck to go to the castle and destroy the portal. The game involves lots of exploring and killing various creatures and humans, while working out which weapon to use. There are also some objects to collect, but you'll have to find out what they're used for. 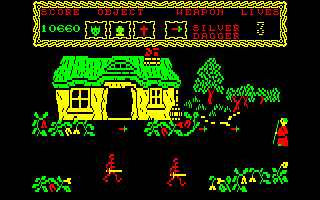 Despite the game using the CPC's four-colour, medium-resolution MODE 1, the graphics are extremely blocky, and the sound effects are equally awful – yet for some reason, it's still not all that bad a game; it's just that getting through the swamp is extremely difficult. You have returned from a long holiday to your job in a custard pie factory, only to find that all production has stopped – and as the repairman, you must fix and restart all of the machinery, otherwise you will be sacked! This is a platform game in which you must explore rooms in the search for the objects that will activate the machinery, and each object is often to be found a long way from where it is to be used. There is also a range of enemies to be found in most rooms, which will sap your energy if you touch them. 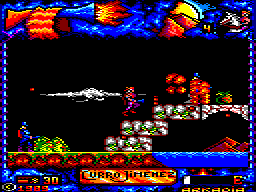 Both the graphics and sound effects are basic, although a lot of colour is used, but the main problem is that movement of your character is slow, and it takes a long time to go from one place to another, which makes a potentially good game boring instead. Times are tough on Hardscrabble Island, and you dream of getting away from the island – so when someone invites you on a diving expedition to hunt for treasure, it's an offer you can't refuse. However, many of the characters on Hardscrabble Island are dodgy, and you'll be working with some of the dodgiest characters of them all – and one of them is a traitor... There are two variations of the game, but I'll leave it to you to discover them. 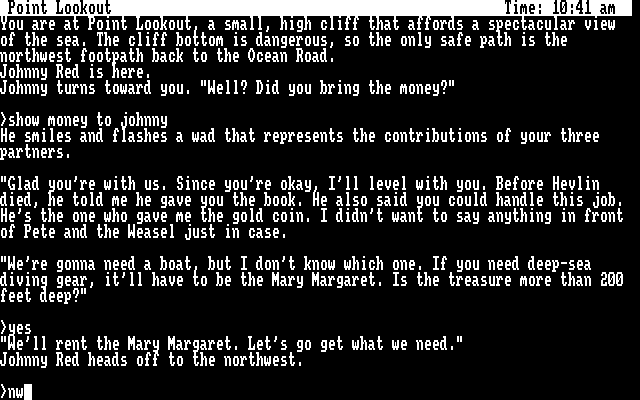 This is a great text adventure from Infocom with enough mystery and excitement to captivate you for some time.